I have only read the sample at this stage and now have bought complete book. What I read I enjoyed and will get to read the rest soon. 4.0 out of 5 starsJake's story does not disappoint! Life expectancy for characters in a Jerrie Alexander book are not very long. High body count in this latest in the Lost and Found, Inc series. 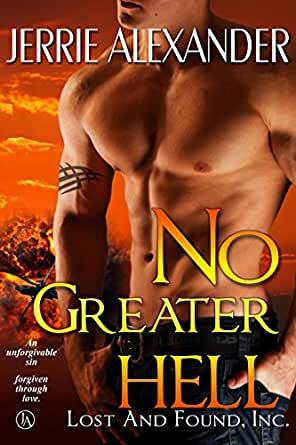 If you haven't read the previous books in this series I recommend at least reading Hell or High Water before reading this as Jake's story starts in that book. Also anything from this point could be spoilerish if you haven't read the previous books. Jake's fate was hanging in the balance in the second and third book in the series. We finally get to see him recovered from his surgery but find that he is living with a ton of guilt over the things he did when he had the brain tumor. One of his biggest regrets is what he did to Holly even though in the end he saved her. Jake says good bye to his friends at Lost and Found, Inc and goes to work on his Aunt's farm. After a violent storm ravages the towns around him the last person he expects to see working at the temporary hospital set up to help storm victims is Holly. After her horrible ordeal of being kidnapped and almost raped by a madman Holly decided she wanted to help others and went back to school to be a nurse. She is part a of volunteer medical team that gets sent to towns that have experienced disasters. Its been two years since she's seen Jake and she surprised to see Jake bring victims in. She's forgiven him for the past now if she could just convince Jake to forgive himself. As with all disasters not only does it bring out good people but it also brings out the bad guys. Holly gets herself on the radar of a killer after a situation and Jake's immediately steps up to protect her even though he is at war with himself over his attraction to Holly. After reading book four I had to write this review. "Caution May Contain Spoilers"
In general the first 3 books were okay. The only thing that really bugged me was the guys made some really dumb decisions. For men who were trained as SEALs or had other military training they acted like they didn't have a clue. As for book 4. It was even worse. The first problem was all the random and senseless killing. Next you had the guys at the ranch and they acted stupid. Come on they knew someone was after the girl and they just let some stranger approach them. One of them or both for that matter should have been on high alert and openly arm. And finally you built the agency a high tech, secure compound were they stashed the girl and then they allowed some reporter to enter. Another dumb move. These guys should have had the place locked down tight were no one could enter. 5.0 out of 5 starsA wonderful end to one of the best series I have ever read! It rocked it! I've read the 'Lost and Found' series and have loved every book. Each book took the reader deep into the plot and made us feel like we knew the characters. It made us feel like we were there and that the outcome would be a part of our lives. I read the first book in 2013. During book three we met Jake. His story pulled at my heart like few have. Jake is a wounded soldier with a dark past. He did some terrible things and almost got the one he loved, from his past, killed. Jake could not remember who he was and his entire personality changed after his helo crashed in Afghanistan. Doctors found that he had a brain tumor that was causing his problems. The group from Lost and Found had gone to school together and after they left the service they formed LNF. Jake had been part of that group from school. They rallied around Jake and he had the operation. Now we move to this book Not all of his memory came back. He still felt unworthy to get involved with Holly, the woman he loved earlier and had saved so he left. Two years went by, then during a hurricane rescue mission in southeast Texas they run into each other. Holly is a nurse working in his hometown. During rescue operations a drug pusher makes Holly his target as he believes she got his brother killed. As Jake and others try to keep Holly alive they attempt to work thru their issues. A very gripping suspenseful story. Will keep the reader on edge every minute. A must read whether you have read the rest of the series or not. Please read Jake and Holly's story but don't miss the rest of the series! 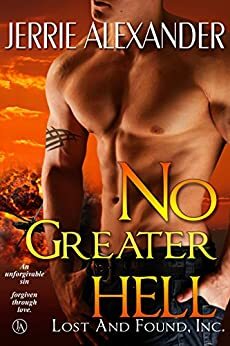 No Greater Hell is the 4th book in the Lost and Found, Inc series. Jerrie Alexander has hit another one out of the park! Jake and Holly's story was not only well written, it was heart pounding, page turning, and filled with more twists and turns that had me reading this book faster than I thought possible for a book over 300 pages. Each paragraph flowed into the next never losing a beat. I never thought I would enjoy reading a dark thriller, but with each of Jerrie's books I found myself drawn into her Lost and Found Series and hope it continues with more books to come. I am more of a paranormal girl, however, Jerrie has become one of my favorite authors. She gives you dark, but also blends in the good, trustworthy Alpha Men who show women there is dark in the world, but they are there to protect them at all costs. I truthfully can say I laughed, cried, cheered and worried for Jerrie's characters and want to keep reading their stories! Jake and Holly’s story is one for the record books. You don’t have to have read a preceding book, as Ms. Alexander has done a fine job of providing the back story. This time Holly is in the crosshairs of a vengeance-driven hitman without a conscience. Bodies are falling will nilly. But Jake has an opportunity for redemption with Holly—although she has long-ago forgiven him. He just can’t forgive himself. Guilt guides his every moment. But justice prevails once again.